This past November, I completed my 7th season as lead voice on Riverside TV broadcasts of CIF HS Football. 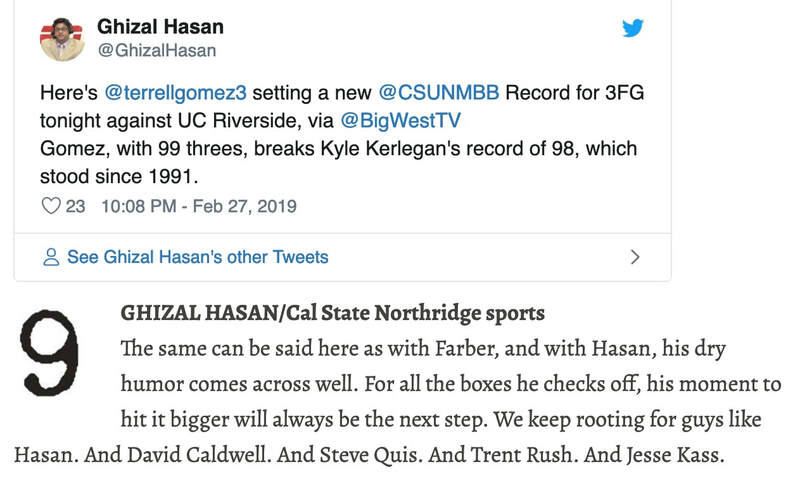 Additionally, I've called CSUN Men's Basketball since 2013-14, and 2019 is my 10th season broadcasting for UC Riverside Baseball. 2018-19 will be my eleventh year calling NCAA athletics, primarily in the Big West Conference, as well as select events in the West Coast Conference, Mountain West, and Pac-12. Along with Men's Basketball & Baseball, I've broadcast Men's & Women's Soccer, Women's Volleyball, Women's Basketball & Gymnastics at the Division 1 level. In addition to standing assignments, over the past couple of seasons, I've also called select NCAA events for San Diego, UCLA, Fresno State, Loyola Marymount, and Nevada. I've also covered both Junior College and Prep Athletics, as Play-by-Play Announcer, Reporter & Studio Analyst, for local television outlets in Southern California. Born and raised in Northern New Jersey, I'm a proud graduate of both UC Irvine's School of Humanities and the UCLA School of Film, Television & Digital Media. Prior to my broadcasting life, I worked as a writer, completing assignments for various film & television production companies. I currently live in Los Angeles, where I embark on a daily search for the world's best gyro, preferably with a generous portion of garlic sauce.